Hanna Darne, Kaitlyn Farrington, Maycee Nowland, Logan Sanders, Nicole Emlen, Ben Cummins, Rhys Velde, Jessie Thomas and Emily Salyers are members of Sentinel’s Eco Club. Sentinel’s Eco Club was started in 2010 by a group of students with the purpose of making the school more ecologically conscious. In past years, the Eco Club has organized trash pickup days to clean the student parking lot and to help with recycling. The trash pickup was a way for Eco Club to reach out to the community by picking up trash from the parking lots as well as the surrounding neighborhood. In addition, they helped provide recycling bins for every classroom in the school and took a few hours each week to help the Special Education Department collect and recycle. This year, they are hoping to expand their impact on their school and community. They are currently in the midst of multiple projects that will help achieve their goal. They are educating Sentinel’s student body on the impact they have on their school and community. They also want to lower the environmental impact the school is making on the planet. One project that they are currently working on is to purchase insulated water bottles and donate them to as many students as possible. They are part of the National Wildlife Federation’s Eco-School grant and were awarded $1,000 for the project. After the flasks are donated to students, the Eco Club will be monitoring the amount of disposable water bottles sold at their Sparta Mart and the disposable coffee cups from the Spartan Steamer. As a way to hype this up, they will be having a “taste test” for students to give their opinion on which water tastes better: bottled water or tap water. Eco Club co-president Maycee Nowlen says, “The project is a great opportunity for multiple groups at Sentinel to work together in the hopes of reducing our waste.” The data-driven project will help reduce the amount of non-reusable plastic cups and straws that are used when purchasing a beverage from the coffee cart, and this will also help reduce the number of disposable plastic water bottles that are used daily by students hoping to stay hydrated. 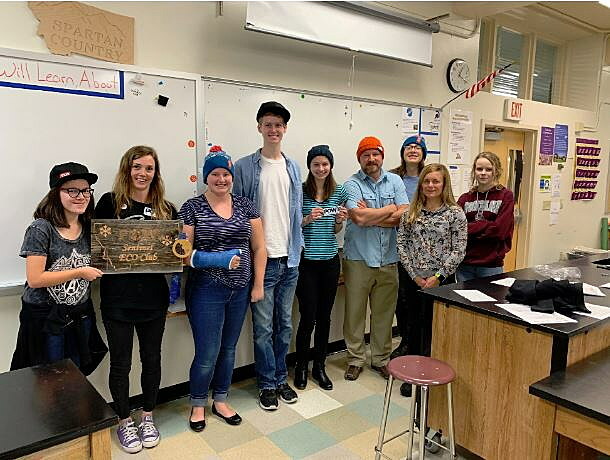 “This project is helping us jumpstart our pathway to increase our score for our LEED (Leadership in Energy and Environmental Design) Dynamic Plaque or Arc,” says Sentinel’s Eco Club advisor and Earth Science teacher, Mr. Ben Cummins. Data is currently being input into a software called Arc (LEED Dynamic Plaque) to look at the overall “health” of the school considering five different categories: energy use, water use, waste/recycling, transportation, and the human experience. During the proposed school bond, Mr. Cummins suggested the new aspects of the building become LEED certified. However, after looking more into this issue, he realized that it was too expensive and better if the money was used in more productive ways. In an effort to educate the student body, the Eco Club arranged a speaker to talk about climate change during an assembly. The presenter, Olympic Gold Medalist Kaitlyn Farrington, spoke on behalf of Protect Our Winters (POW), an organization that educates people on the effects of global warming and climate change. Her presentation stuck with Sentinel’s students and they still talk about it constantly. Pursuing one of their goals, the Eco Club has started bringing in guest speakers to talk about local and global environmental issues. They’ve had a speaker come in and talk about the difference your food selection makes on your carbon footprint and as the year rolls on, are hoping to get more speakers to come to visit our school. Finally, the Eco Club members are individually talking with teachers and staff members about ways to make their classroom eco-certified and more sustainable. If you would like to participate and become a guest speaker or help with donations towards Sentinel’s Eco Club, please contact Benjamin Cummins at bwcummins@mcpsmt.org. Cadence Campbell is a freshman at Sentinel High School. This Sustainable Missoula column is brought to you – via the Missoula Current – every Friday by Climate Smart Missoula and Home ReSource. Happy Holidays All. And please: over the holidays, go green, make connections with people and places, and if you’re purchasing gifts, buy local or Fair Trade.